There are now four different Danish editions of Kierkegaard collected works. The first edition, edited by A.B. Drachman, J.L. Heiberg, and H.O. 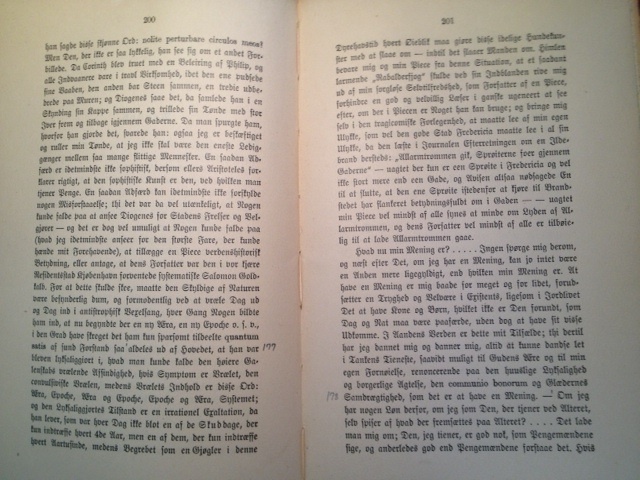 Lang was published by Gyldendal between 1901-1906 and comprised 14 volumes. The second edition, published between 1920-1936, was essentially a corrected version of the first edition with the inclusion of a very helpful fifteenth volume that contained author and subject indexes for all the individual volumes as well as a glossary of the more important terms in Kierkegaard’s authorship. A third inexpensive popular edition of Kierkegaard’s collected works in 20 volumes was published in the 1960s. This edition was never intended for use by scholars and is marred by numerous errors that were more than likely a result of how quickly the edition was produced (one volume per month according to Tony Aalgaard Olesen). The second edition is generally considered to be the best of the collected works as well as the most readily available. It’s still possible to find it in used bookstores in Denmark for a reasonable price. A casual web search I did just now turned up three copies at Vangsgaards Antikvariat for between 1,000DK and 1,800DK (approximately $150-$300). The first edition is still preferred by scholars, however, because the second edition, produced as it was during a period of the resurgence of Nordic nationalism was printed in Blackletter, or Gothic type, and many contemporary scholars find that difficult to read. The English translations of Kierkegaard supervised by Howard V. Hong and Edna H. Hong and published by Princeton University Press in the ‘80s and ’90s thus have page correlation numbers to the first, rather than the second, edition of Kierkegaard’s collected works. Unfortunately, the first edition of Kierkegaard’s collected works is increasingly difficult to find and generally very expensive. Fortunately, there is a new edition of Kierkegaard’s collected works. This new edition, produced by the Søren Kierkegaard Research Center in Copenhagen is distinguished from the earlier editions by a new title. Whereas all three earlier collected works were titled Søren Kierkegaards Samlede Værker (literally Søren Kierkegaard’s collected works, or SV), the new edition is titled Søren Kierkegaards Skrifter (Søren Kierkegaard’s writings, or SKS). There is much to recommend the new edition. The individual volumes have been beautifully produced, at least from an aesthetic standpoint, and each is accompanied by a helpful companion volume of commentary. The edition purports to be a “critical” one, but unfortunately falls short of that ideal. It was produced too quickly to ensure the kind of quality that is requisite for a critical edition and the editorial staff was generally too inexperienced in that type of work. The 55 volumes were produced between 1997 and 2013, or 16 short years compared, for example, to the critical edition of Kant writings on which work began in 1900 and is apparently still continuing! The haste with which this new edition was produced is likely the explanation for problems such as the one I identified in the notes to my translation of Kierkegaard’s Repetition. The fictional narrator of that work refers to the “disappearance” of the young man who was the subject of his observations. “[D]isappearance,” as I explain in a note, was originally “death.” Kierkegaard apparently changed “death” (Død) to “disappearance” (Forsvinden) after learning that his former fiancée, Regine Olsen, had become engaged. SKS has Forvinden (recovery), however, rather than Forsvinden. The original 1843 edition of Repetition, on the other hand, has Forsvinden, not Forvinden and since there is no explanation for the change in SKS, it appears it’s simply an error. So the new edition is not perfect. The critical apparatus is extensive, but somewhat arbitrary in what it includes and does not include and the price for all 55 volumes (at approximately $100 each) is prohibitively expensive. Despite this, however, it will become the standard scholarly edition because not only can volumes be purchased individually, but the entire edition is available in searchable form online! For that reason alone, I find myself often referring to it. In my opinion, however, the most reliable text is still that of the second edition. The type takes a little getting used to, but not so long as many people seem to fear. I’m very fortunate, actually, in that not only do I have a second edition in excellent condition, someone actually went through my edition and put page correlation numbers to the first edition in the margins. I kid you not, there are page correlation numbers on every single page of every single volume. Not only are there these numbers, whoever put them there also put a tiny mark at the point in the line of the text where the new page began. You can see these lines, just barely, in the photo above. There’s one between “saa” and “aldeles” on the page at the left, and another after the dash and just before “Om” on the page at the right. Pretty cool, eh! My theory is that my copy of the second edition must have been used in the production of the page correlation tables in the third edition, or in Alastair McKinnon’s concordances. It’s hard to imagine someone would have undertaken the labor involved in putting in all those numbers unless he were being paid to do so. I’m grateful to whoever did it though. I can now quickly check the accuracy of the Hongs’ translations even though they include page correlation numbers only to the first edition. This extremely rare (very likely one of a kind) copy of the second edition of Kierkegaard’s collected works is only one of the many antiquarian treasures I collected while I lived in Denmark. I plan to write about more of my treasures later.